All of us have experienced the loving encounter with God on our weekend, in our friendship groups, or in our Ultreya. Help the Catholic Cursillo of Cincinnati to continue the good work of evangelization and sharing His love! A monthly gift of $25 will pay for half of our annual printing and mailing costs for newsletters and event reminders! 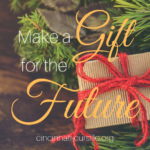 Please consider including Cincinnati Cursillo in your estate planning and when thinking of bequests to honor a friend or loved one. The funds collected are used solely for the continuation of work begun in faith by our predecessors almost fifty years ago. Our movement would not have survived this long without the blessings of the Holy Spirit and your support. Please give generously to strengthen our mission for the next 50 years of service to our communities. Catholic Cursillo of Cincinnati is a registered 501(c)3 organization. Your gift is tax-deductible to the extent allowed by law.